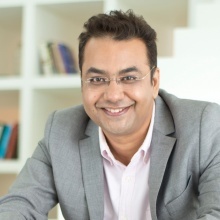 An instrumentation engineer with a MBA in Marketing and a Diploma in Advertising and PR, Sujit leads a diversified communications team at Godrej, one of India’s most reputed conglomerates and is responsible for building and sustaining the Group’s reputation across stakeholders. Prior to joining Godrej, Sujit led a global Corporate Communications function at Tata Chemicals Limited, a global Chemicals company with operations across Asia, Europe, Africa and America. Sujit has extensive experience in working across the communication spectrum including in internal/external communications, global branding, crisis communications, digital PR, sustainability etc. He is among the few IABC accredited business communicators in India and the winner of the IABC International Gold Quill award, the only Indian communications professional to win this global accolade thrice. In 2016 he was listed as India’s top ten men in corporate communications by Reputation Today and featured on the PRWeek Global Power Book 2016. Under his leadership, Godrej won the prestigious Diamond SABRE Award 2015 South Asia - Company of the year and Diamond Sabre Award 2016 – Company of the year – Asia Pacific and South Asia. Sujit lives in Mumbai. He loves to travel, meet people, explore cultures and try different cuisines. He is a weekend farmer, practices kickboxing and is an advocate of sparrow conservation.